“White America” redirects here. For the song by Eminem, see The Eminem Show. Center-North of the USA (southern USA = southwest mexican heritage +/and southeast semi-african origins). White American (often used interchangeably with "Caucasian American" and, within the United States, simply "white") is an umbrella term officially employed by some U.S. government agencies, per standards issued by the Office of Management and Budget, for the classification of United States citizens or resident aliens "having origins in any of the original peoples of Europe, the Middle East, or North Africa". Like all U.S. racial categories, White American has a "Not Hispanic or Latino" and a "Hispanic or Latino" component, the latter consisting mostly of White Mexican Americans. German Americans (16.5%), Irish Americans (11.9%), English Americans (9.0%), Italian Americans (5.8%), Polish Americans (3.3%), French Americans (3.1%), Scottish Americans (1.9%), Dutch Americans (1.6%), Norwegian Americans (1.5%), Swedish Americans (1.4%), Scotch-Irish Americans (1.2%), Russian Americans (1.0%), and Welsh Americans (0.7%) make up more than half of the White population. Whites constitute the majority, with 80% (66% non-Hispanic Whites and nearly all 14% of Hispanic) or 75% (65.4% non-Hispanic and 9.6% Hispanic) of the U.S. population. Today, the term "white American" or "European American" can encompass many different ethnic groups. Although the United States Census purports to reflect a social definition of race, the social dimensions of race are more complex than Census criteria. The term "White ethnic" is used to group White Americans who are of southern and eastern European ancestry. The 2000 U.S. census states that racial categories "generally reflect a social definition of race recognized in this country. They do not conform to any biological, anthropological or genetic criteria." The Census question on race lists the categories White, Black or African American, American Indian and Alaska Native, Native Hawaiian or Other Pacific Islander, Asian, plus "Some other race", with the respondent having the ability to mark more than one category. The government defines White people as "people having origins in any of the original people of Europe, the Middle East, or North Africa. In U.S. census documents, the designation white overlaps, as do all other official racial categories, with the term Hispanic or Latino, which was introduced in the 1980 census as a category of ethnicity, separate and independent of race. Hispanic and Latino Americans make up a racially diverse group, and as a whole are the largest minority in the country. Many Arab and other Middle Eastern Americans and North African Americans, as well as non-European Jewish Americans, conflate race and geographic/national origin. In cases where individuals do not self-identify, the U.S. census parameters for race give each national origin a racial value. Additionally, people who reported Muslim (or a sect of Islam such as Shi'ite or Sunni), Jewish, Zoroastrian, or Caucasian as their "race" in the "Some other race" section, without noting a country of origin, are automatically tallied as white. The US Census considers the write-in response of "Caucasian" or "Aryan" to be a synonym for white in their ancestry code listing. President Abraham Lincoln was a descendant of 17th century English and Welsh immigrants. According to race scholars such as Karen Brodkin, in the United States, essentially anyone of European descent is considered white and Jews are also considered white. However, while the census asserts that "race" and "ethnicity" are separate, some Hispanics of primarily European descent may not consider themselves white and may not be considered white by others, possibly because of the long-held stereotype of Hispanics being given a non-white racial value. Likewise, while people of Middle Eastern and North African descent are included in the white category in the census, studies have found that Arab American teenagers may sometimes construct identities that distinguish them from "white society". Some American white people, mainly those of distant descent from multiple European countries, tend to see themselves as belonging to no ethnic group at all, but just "American." 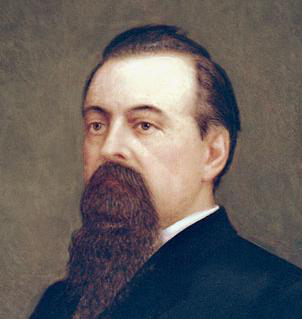 Romualdo Pacheco, 12th governor of California, a White American of Spanish-Mexican descent. The cultural boundaries separating white Americans from other racial or ethnic categories have changed significantly over the course of American history. Even among Europeans, those not considered white at some time in American history are the Ashkenazi Jews, Italians, Greeks, and other European people. Early on in the U.S., white generally referred to those of British Isles or northwestern European descent. David R. Roediger argues that the construction of the white race in the United States was an effort to mentally distance slave owners from slaves. The process of officially being defined as white by law often came about in court disputes over pursuit of citizenship. In the early 20th century, it became common for white supremacists to promote the features of the blond, blue-eyed Nordic race as the "master race". As whites are the dominant racial and cultural group, according to sociologist Steven Seidman, writing about the most prominent perspective among researchers, "White culture constitutes the general cultural mainstream, causing non-White culture to be seen as deviant, in either a positive or negative manner. Moreover, Whites tend to be disproportionately represented in powerful positions, controlling almost all political, economic, and cultural institutions." Yet, according to Seidman, Whites are most commonly unaware of their "privilege" and the manner in which their culture has always been dominant in the US, as they do not identify as members of a specific racial group but rather incorrectly perceive their views and culture as "raceless", when in fact it is ethno-national (ethnic/cultural) specific, with a racial base component. Whites (non-Hispanic and Hispanic) made up 79.8% or 75% of the American population in 2008. This latter number is sometimes recorded as 77.1% when it includes about 2% of the population who self-identified as "white" in combination with one or more other races. The largest ethnic groups (by ancestry) among white Americans were Germans, followed by the Irish and the English. White Americans (again, non-Hispanic and Hispanic Whites) are projected to remain the majority, though with their percentage decreasing to 73% of the total population by 2050. However, the projections are that the non-Hispanic White population will become less than 50% of the population by 2042, in part because Non-Hispanic Whites have the lowest fertility rate of any major racial group in the United States. While over ten million white people can trace part of their ancestry back to the Pilgrims who arrived on the Mayflower in 1620 (this common statistic overlooks the Jamestown, Virginia foundations of America and roots of even earlier colonist-descended Americans, such as Spanish Americans in St. Augustine, Florida), over 35 million whites have at least one ancestor who passed through the Ellis Island immigration station, which processed arriving immigrants from 1892 until 1954. See also: European Americans. White Americans as percent of population, Census 2000. According to the Census definition, white Americans are the majority racial group in almost all of the United States. They are not the majority in Hawaii, many American Indian reservations, parts of the South known as the Black Belt, and in many urban areas throughout the country. Overall the highest concentration of those referred to as "White alone" by the Census Bureau was found in the Midwest, New England, the Rocky Mountain states, Kentucky, and West Virginia. The lowest concentration of whites was found in southern and mid-Atlantic states. Template:Race and income in US White Americans have the second highest median household income and personal income levels in the nation, by race. The median income per household member was also the highest, since White Americans had the smallest households of any racial demographic in the nation. In 2006, the median individual income of a White American age 25 or older was $33,030, with those who were full-time employed, and of age 25 to 64, earning $34,432. Since 42% of all households had two income earners, the median household income was considerably higher than the median personal income, which was $48,554 in 2005. Jewish Americans rank first in household income, personal income, and educational attainment among white Americans. In 2005, white households had a median household income of $48,977, which is 10.3% above the national median of $44,389. Among Cuban Americans, with 86% classifying as White, those persons born in the US have a higher median income and educational attainment level than most other whites. The poverty rates for White Americans are the second-lowest of any racial group, with 10.8% of white individuals living below the poverty line, 3% lower than the national average. However, due to Whites' majority status, 48% of Americans living in poverty are white. Whites' educational attainment is the second-highest in the country, after Asian Americans'. Overall, nearly one-third of White Americans had a Bachelor's degree, with the educational attainment for whites being higher for those born outside the United States: 37.6% of foreign born, and 29.7% of native born Whites had a college degree. Both figures are above the national average of 27.2%. Gender income inequality was the greatest among whites, with White men outearning white women by 48%. Census Bureau data for 2005 reveals that the median income of white females was lower than that of males of all races. In 2005, the median income for White females was only slightly higher than that of African American females, indicating that income inequities seem to run along gender lines more so than along racial lines. White American culture derived its earliest influences from from English, Scottish, Welsh, and Irish settlers and is quantitatively the largest proportion of American culture. From their earliest presence in North America, White Americans have contributed literature, art, agricultural skills, foods, clothing styles, music, and language to American culture. In his 1989 book, "Albion's Seed" (ISBN 0195069056), David Hackett Fischer asserts that four regional cultures of the U.S. derive from the immigration and settlement in America of four different groups from various parts of the British Isles. He asserts that the culture of each of these groups persisted, providing the basis for the modern United States. According to Fischer, the foundation of American culture was formed from four mass migrations from four different regions of the British Isles by four different ethno-cultural groups during the 17th and 18th centuries. New England's formative period occurred between 1629 and 1640 when Puritans, mostly from East Anglia in England, settled there, thus forming the basis for the New England regional culture. The next mass migration was of southern English cavaliers and their Irish and Scottish domestic servants to the Chesapeake Bay region between 1640 and 1675. Their folkways formed the basis of the American Southern regional culture. Then, between 1675 and 1725, thousands of Irish, English and German Quakers, led by William Penn, settled the Delaware Valley. This resulted in the formation of the General American culture, although, according to Fischer, it is really just a regional culture, even if it does today encompass most of the U.S. from the mid-Atlantic states to the Pacific Coast. Finally, several hundred thousand Irish, Scottish and English settlers from the borderlands of Britain and Ireland migrated to Appalachia between 1717 and 1775. The establishment of their folkways there resulted in the Upland South regional culture, which has since spread west to West Texas and parts of the U.S. Southwest. In his book, Fischer presents several interesting ideas. One is that the U.S. is not a country with one "general" culture and several "regional sub-cultures." According to Fischer, the U.S. just has four main "regional cultures," and understanding that helps one to understand many aspects of American history and modern-day American life. Also, Fischer asserts that it was not merely important where different settlers came from, but when. Various population groups all have their own distinct beliefs, fears, prejudices and hopes. According to Fischer, when different regional groups of settlers from Britain and Ireland came to the New World, those feelings and beliefs more or less froze in time in America, even if they eventually changed in their places of origin. Many later European and Middle-Eastern immigrants, upon their arrival in the United States, felt isolated from the mainstream, English-speaking, Anglo-Saxon, Protestant population due to linguistic, religious, and cultural differences. They overcame this isolation by quickly creating closely-knit neighborhoods of members of their own ethnic groups. Such neighborhoods often grew into large, self-contained districts with their own churches and shops bearing signs in their own native languages. The most notable of these ethnic districts were New York's Little Italy, Hamtramck in Michigan, the Irish Channel in New Orleans, Little Canada in the Minneapolis-St. Paul area. Various religious sects have developed insular communities, including the modern day Amish communities in Pennsylvania, as well as the Orthodox and Hasidic Jewish communities in Brooklyn's Borough Park, and Mormons in the entire state of Utah, Mesa, Arizona, Pocatello, Idaho and other cities. Jennie Jerome, mother of Sir Winston Churchill was rumoured to have had an Iroquois Indian great-grandfather. Some whites have varying amounts of Native American ancestry; this admixture is claimed by white celebrities such as Chuck Norris, Cher, Megan Fox, Johnny Depp, and Jessica Biel. British Prime Minister Winston Churchill's mother (Jennie Jerome) and singer Elvis Presley had partial Native American ancestry. There are also some white people who are or were descendants of Pocahontas, including First Ladies Edith Wilson and Nancy Reagan, astronomer Percival Lowell, as well as Wallis, Duchess of Windsor, the wife of King Edward VIII of the United Kingdom. According to U.S. Census Bureau statistics from 1980, 1990, and 2000, one out of every three white Americans is descended from only one European nationality; one out of three is descended from two European nationalities, and one out of every three has three or more European nationalities in their family tree. A study by U.S. Census Bureau statisticians of the results of the 1980 Census concluded that approximately 62% of white Americans are either wholly or partly of English, Welsh, Irish, or Scottish ancestry. It was also determined that 86% of U.S. whites are of Northwestern European ancestry, and 14% are of Southern and Eastern European descent. In a recent study, Gonçalves et al. 2007 reported Sub-Saharan and Amerindian mtDna lineages at a frequency of 3.1% (respectively 0.90% and 2.2%) in White Americans of European descent. In another study, about 30% of all White Americans, approximately 66 million people, have a median of 2.3% of Black African admixture. ^ a b "Detailed Tables - American FactFinder; T3-2008. Race ". 2008 Population Estimates. U.S. Census Bureau. http://factfinder.census.gov/servlet/DTTable?_bm=y&-state=dt&-context=dt&-ds_name=PEP_2008_EST&-CONTEXT=dt&-mt_name=PEP_2008_EST_G2008_T003_2008&-tree_id=809&-redoLog=false&-currentselections=PEP_2006_EST_G2006_T004_2006&-geo_id=01000US&-geo_id=02000US1&-geo_id=02000US2&-geo_id=02000US3&-geo_id=02000US4&-search_results=01000US&-format=&-_lang=en. Retrieved 2010-03-16. ^ a b c The "Some other race" category, consisting of Hispanic or Latino respondents overwhelmingly, is a non-standard race. In official figures it is eliminated and most people in it reclassified as White, thus augmenting the number of Hispanic Whites and in turn of total Whites. See the reference for the larger figures. ^ a b c d e "T4-2008. Hispanic or Latino By Race ". 2008 Population Estimates. U.S. Census Bureau. http://factfinder.census.gov/servlet/DTTable?_bm=y&-state=dt&-context=dt&-ds_name=PEP_2008_EST&-CONTEXT=dt&-mt_name=PEP_2008_EST_G2008_T004_2008&-tree_id=809&-redoLog=false&-currentselections=PEP_2006_EST_G2006_T004_2006&-geo_id=01000US&-geo_id=02000US1&-geo_id=02000US2&-geo_id=02000US3&-geo_id=02000US4&-search_results=01000US&-format=&-_lang=en. Retrieved 2010-03-15. ^ a b c d e "B03002. HISPANIC OR LATINO ORIGIN BY RACE". 2008 American Community Survey 1-Year Estimates. U.S. Census Bureau. http://factfinder.census.gov/servlet/DTTable?_bm=y&-ds_name=ACS_2008_1YR_G00_&-CONTEXT=dt&-mt_name=ACS_2008_1YR_G2000_B03002&-redoLog=true&-geo_id=01000US&-format=&-_lang=en&-SubjectID=15233308. Retrieved 2010-03-16. ^ Lee, Sandra S. Mountain, Joanna. Barbara, Koening A. The Meanings of Race in the New Genomics: Implications for Health Disparities Research. Yale University. 2001. Accessed October 26, 2006. ^ The United States Census Bureau, for example, uses "white" rather than "White American", but this is true of most races: "American Indian" and "African American" are the exceptions. "Racial and Ethnic Classifications Used in Census 2000 and Beyond". http://www.census.gov/population/www/socdemo/race/racefactcb.html. Retrieved 2006-10-05. ^ a b "Revisions to the Standards for the Classification of Federal Data on Race and Ethnicity". http://www.whitehouse.gov/omb/fedreg_1997standards/. Retrieved 2010-03-16. ^ Questions and Answers for Census 2000 Data on Race from U.S. Census Bureau, 14 March 2001. Retrieved 15 October 2006. ^ a b "US Census Bureau, Whites in the 2000 Census". http://www.census.gov/prod/2001pubs/c2kbr01-4.pdf. Retrieved 2006-10-05. ^ "American FactFinder Help". United States Census Bureau. http://factfinder.census.gov/home/en/epss/glossary_h.html#hispanic_or_latino_origin. Retrieved 2008-11-11. "Origin can be viewed as the heritage, nationality group, lineage, or country of birth of the person or the person's parents or ancestors before their arrival in the United States. People who identify their origin as Spanish, Hispanic, or Latino may be of any race." ^ Karen Brodkin, How Jews Became White Folks and What That Says About Race in America (New Brunswick NJ, 1998). ^ John Tehranian, "Performing Whiteness: Naturalization Litigation and the Construction of Racial Identity in America," The Yale Law Journal, Vol. 109, No. 4. (Jan., 2000), pp. 825–827, 847. ^ Sweet, Frank W. Legal History of the Color Line: The Notion of Invisible Blackness. Backintyme Publishers (2005), ISBN 0939479230. ^ "United States Population Projections By Race and Hispanic Origin: 2000 TO 2050" (Excel). United States Census Bureau. http://www.census.gov/ipc/www/usinterimproj/natprojtab01a.pdf. Retrieved 2008-05-05. ^ Brewer, Cynthia; Trudy Suchan (2001). Census 2000, The Geography of US Diversity. Redlands, CA: ESRI Press. ^ "Distribution of those identifying as White alone, by state, US Census Bureau". http://factfinder.census.gov/servlet/ThematicMapFramesetServlet?_bm=y&-geo_id=01000US&-tm_name=ACS_2005_EST_G00_M00627&-ds_name=ACS_2005_EST_G00_&-_MapEvent=displayBy&-_dBy=040. Retrieved 2006-10-05. ^ "Income, Poverty, and Health Insurance Coverage in the United States: 2004" (PDF). http://www.census.gov/prod/2005pubs/p60-229.pdf. ^ "US Census Bureau report on educational attainment in the United States, 2003". http://www.census.gov/prod/2004pubs/p20-550.pdf. Retrieved 2006-12-23. ^ "US Census Bureau, Personal income forum, Age 25+, 2005". http://pubdb3.census.gov/macro/032006/perinc/new03_000.htm. Retrieved 2007-01-20. This page uses content from the English language Wikipedia. The original content was at White American. The list of authors can be seen in the page history. As with this Familypedia wiki, the content of Wikipedia is available under the Creative Commons License.